With the World Cup in Brazil in 2014 it’s no surprise that we’ve seen a rash of football-themed online slots hit the casinos. 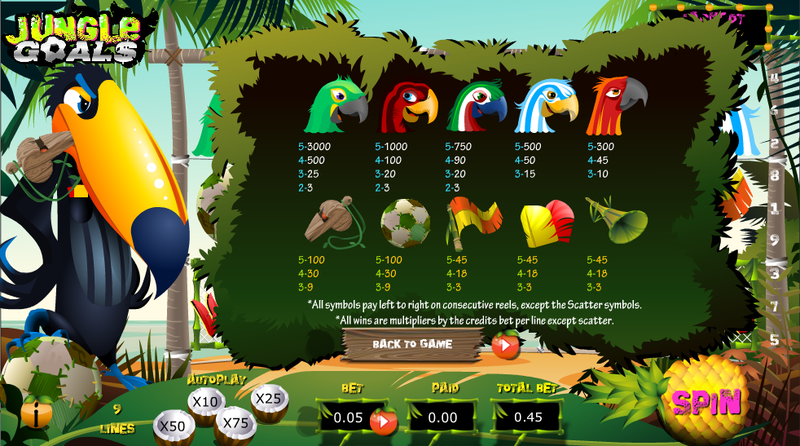 Over at 888 Casino you can now get your hands on one more in this genre; it’s called Jungle Goal$ and it’s from the in-house developer, Random Logic. To add to the fun, it’s also got a progressive jackpot. 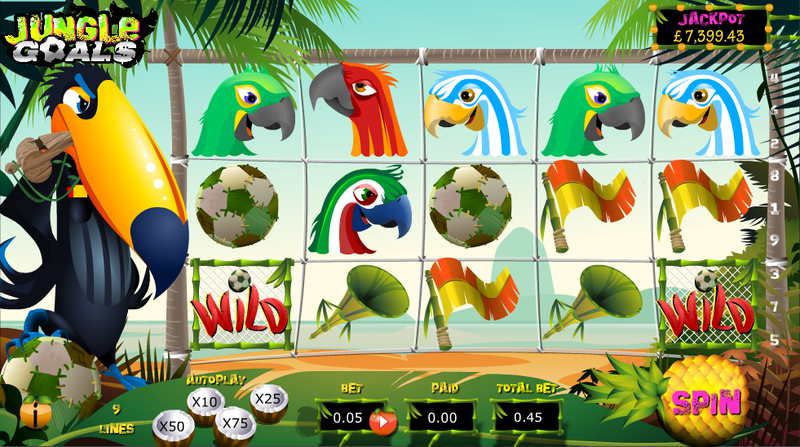 Jungle Goal$ is a five reel game with nine fixed paylines and as well as a football theme it’s also got a tropical feel. Those reels are set inside a frame tied between two palm trees and the backdrop is a deserted beach being washed by a calm sea. The symbols are all footie-related and include a trumpet, red and yellow feathers/cards, a linesman’s flag, a football, a referee’s whistle and then five tropical birds whose colours match those of some of the bigger footballing nations. The Brazilian bird is the most valuable and worth 3000x your stake for five on an active payline. There are two wild symbols, one which appears on all reels and one which just lives on reel three; that one will multiply any winnings by 3x if it contributes to the combo. There’s also a gold trophy scatter symbol which activates the main feature. The main feature on offer here is ten, twenty or an impressive fifty free spins and they are yours if you can land three, four or five of the gold trophy scatter symbols anywhere on the reels. That’s all there is to it so enjoy those spins if they come your way. This mini-game is triggered by landing two different bird symbols in the centre of reels one and five on the same spin. Two Pick Me symbol appear on the reels and all you have to do is pick one for a cash prize. The progressive jackpot is randomly awarded and you can see the running total above the reels. Although the progressive jackpot is randomly awarded, you can give yourself a better chance of winning it by playing with higher stakes. As long as your comfortable with that, increase your stakes a little bit. We like football and we alike online slots so there’s not much to dislike about this game. A progressive jackpot is the icing on the cake.